Did you know? You need an S-1 license to do most heating and cooling repair and install work? Our newest generation of agreements fully encompasses your service needs for both heating and cooling. Our 3rd Generation Service & Energy Conservation Agreement Plans offer improved parts protection, new cooling options, part discounts and more. As always, automatic delivery, TankSure, preferred labor rates and guaranteed 24 hour service is standard. Our propane line insurance policy guards against the malfunction or possibility that something can happen to your propane supply line. This is the line that comes from our tank to your existing supply lines. $25 per year for Lease Agreement customers only. * Power Fuels Propane must install your supply line. ** You must be leasing a propane tank from Power Fuels Propane. *** Does not protect supply line from unauthorized service by another company or damage by the customer. 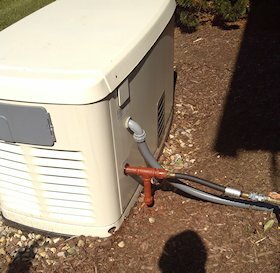 Our S-1 licensed service department and expert technicians are familiar with all types of heating and cooling equipment and can render prompt and consistent quality service, installation and repair. The installation of a complex underground piping system feeding a gas furnace and hot water heater, outdoor appliance and whole house generator. All of the appliances had dedicated lines stemming from an underground manifold with 500,000 BTU twin stage regulators. The tank source was a buried 320 gallon tank. 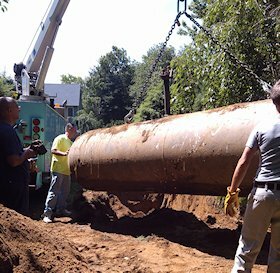 Our crew performing a 1,000 gallon propane tank removal. 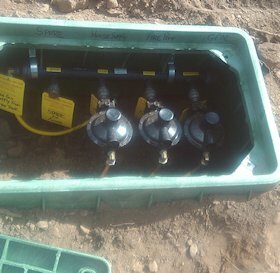 Tank was not properly installed at time of construction and was compromised, requiring a complete replacement. Our Service Department has the equipment and technical know-how to tackle simple to complex tank issues. The tank was first evacuated of existing product by the use of a liquid transfer compressor and then safely removed and disposed of. 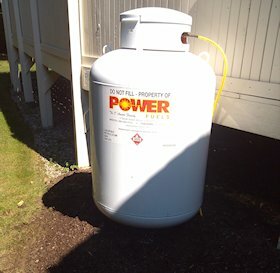 Typical installation of 120 gallon propane tank by rear deck for a standard gas appliance. Installation of propane gas piping to whole house generator. Drip leg piping was painted a rust color to match environment.